House Speaker Paul Ryan signed legislation to repeal the Affordable Care Act on Jan. 7, 2016. President Obama vetoed the bill, but the new administration could open the door for change. Republicans will seek to ensure that "no one is worse off," said House Speaker Paul Ryan, R-Wis., in an interview with a Wisconsin newspaper in early December. "The purpose here is to bring relief to people who are suffering from Obamacare so that they can get something better." But that may be difficult for one big reason: Republicans have also pledged to repeal the taxes that Democrats used to pay for their health law. Without that money, Republicans will have far less to spend on whatever they opt for as a replacement. "It will be hard to have comparable coverage if they start with less money," Gail Wilensky, a health economist who ran the Medicare and Medicaid programs under President George H.W. Bush, said in an interview. "Repealing all the ACA's taxes as part of repeal and delay only makes a true replacement harder," wrote Loren Adler and Paul Ginsburg of the Brookings Institution in a white paper out Monday. It "would make it much more difficult to achieve a sustainable replacement plan that provides meaningful coverage without increasing deficits." The health law's subsidies to individuals buying insurance and the Medicaid expansion are funded by two big pots of money. The first is a series of taxes, including levies on individuals with incomes greater than $200,000, health insurers, makers of medical devices, brand-name drugmakers, people who use tanning salons, and employer plans that are so generous they trigger the much-maligned "Cadillac Tax." Some of those measures have not yet taken effect. However, the Congressional Budget Office estimated in early 2016 that repealing those provisions would reduce taxes by an estimated $1 trillion over the decade from 2016-2025. The other big pot of money that funds the benefits in the health law comes from reductions in federal spending for Medicare (and to a lesser extent, Medicaid). Those include trims in the scheduled payments to hospitals, insurance companies and other health care providers, as well as increased premiums for higher-income Medicare beneficiaries. CBO estimated in 2015 that canceling the cuts would boost federal spending by $879 billion from 2016 to 2025. 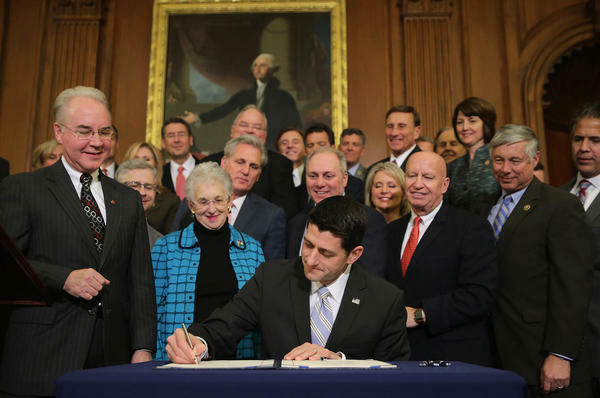 The GOP, in the partial repeal bill that passed in January and was vetoed by President Obama, proposed to cancel the tax increases in the health law, as well as the health premium subsidies and Medicaid expansion. But it would have kept the Medicare and Medicaid payment reductions. Because the benefits that would be repealed cost more than the revenue being lost through the repeal of the taxes, the result would have been net savings to the federal government — to the tune of about $317.5 billion over 10 years, said CBO. But those savings — even if Republicans could find a way to apply them to a new bill — wouldn't be enough to fund the broad expansion of coverage offered under the ACA. If Republicans follow that playbook again, their plans for replacement could be hampered because they will still lose access to tax revenues. That means they cannot fund equivalent benefits unless they find some other source of revenue. Some analysts fear the money may come from more cuts to Medicare and Medicaid. "Medicare and Medicaid face fundamental threats, perhaps the most since they were established in the 1960s," said Edwin Park of the liberal Center on Budget and Policy Priorities, in a recent webinar. Republicans in the House, however, have identified one other potential source of funding. "Our plan caps the open-ended tax break on employer-based premiums," said their proposal, called "A Better Way." House Republicans say that would be preferable to the Cadillac Tax in the ACA, which is scheduled to go into effect in 2020 and taxes only the most generous plans. But health policy analysts say ending the employer tax break could be even more controversial. Capping the amount of health benefits that workers can accept free of taxes "would reduce incentives for employers to continue to offer coverage," said Georgetown University's Sabrina Corlette. James Klein, president of the American Benefits Council, which represents large employers, said they would look on such a proposal as potentially more damaging to the future of employer-provided insurance than the so-called Cadillac Tax, which his group has lobbied hard against. "This is not a time one wants to disrupt the employer marketplace," Klein said in an interview. "It seems perplexing to think that if the ACA is going to be repealed, either in large part or altogether, it would be succeeded by a proposal imposing a tax on people who get health coverage from their employer." Wilensky said that as an economist, getting rid of the tax exclusion for employer-provided health insurance would put her "and all the other economists in seventh heaven." Economists have argued for years that having the tax code favor benefits over cash wages encourages overly generous insurance and overuse of health services. But at the same time, she added, "I am painfully aware of how unpopular my most favored change would be." Republicans will have one other option if and when they try to replace the ACA's benefits — not paying for them at all, thus adding to the federal deficit. While that sounds unlikely for a party dedicated to fiscal responsibility, it wouldn't be unprecedented. In 2003 the huge Medicare prescription drug law was passed by a Republican Congress — with no specified funding to pay for the benefits.